Regulatory T cells (Tregs) constitute an attractive therapeutic target given their essential role in controlling autoimmunity. However, recent animal studies provide evidence for functional heterogeneity and lineage plasticity within the Treg compartment. To understand better the plasticity of human Tregs in the context of type 1 diabetes, we characterized an IFN-γ–competent subset of human CD4+CD127lo/−CD25+ Tregs. We measured the frequency of Tregs in the peripheral blood of patients with type 1 diabetes by epigenetic analysis of the Treg-specific demethylated region (TSDR) and the frequency of the IFN-γ+ subset by flow cytometry. Purified IFN-γ+ Tregs were assessed for suppressive function, degree of TSDR demethylation, and expression of Treg lineage markers FOXP3 and Helios. The frequency of Tregs in peripheral blood was comparable but the FOXP3+IFN-γ+ fraction was significantly increased in patients with type 1 diabetes compared to healthy controls. Purified IFN-γ+ Tregs expressed FOXP3 and possessed suppressive activity but lacked Helios expression and were predominately methylated at the TSDR, characteristics of an adaptive Treg. Naive Tregs were capable of upregulating expression of Th1-associated T-bet, CXCR3, and IFN-γ in response to IL-12. Notably, naive, thymic-derived natural Tregs also demonstrated the capacity for Th1 differentiation without concomitant loss of Helios expression or TSDR demethylation. Type 1 diabetes results from a breakdown in the mechanisms that maintain immune tolerance leading to the eventual destruction of pancreatic β-cells (1). The tissue specificity of the disease is conferred, in part, by the expansion of islet-reactive T effector (Teff) cells controlled by complex genetic and environmental factors (2). Regulatory T cells (Tregs) expressing the transcription factor FOXP3 have emerged as a potent and selective means to counteract this progressive loss of immune tolerance and have led to the development of Treg cellular therapies for the treatment of autoimmune diseases, transplantation, and graft versus host disease (3). For example, CD4+CD25+ Tregs adoptively transferred in an animal model of type 1 diabetes, the NOD mouse, effectively prevent or even reverse disease (4). We have previously reported that the isolation of CD4+CD127lo/−CD25+ T cells could be used to identify and expand a highly pure population of FOXP3+ T cells from human peripheral blood in quantities sufficient for autologous transfer to type 1 diabetic patients (5, 6). Tregs are generally classified into two categories, natural Tregs (nTregs) and adaptive Tregs (aTregs). These Treg subsets differ in their cell surface markers and cytokine profiles, although each has been shown to possess suppressive activity (3). nTregs primarily emerge from the thymus, whereas aTregs are generated in the periphery from naive T cells after Ag exposure (7). In addition to these broad subsets, there is mounting evidence of further phenotypic and functional heterogeneity within the FOXP3+ Treg population, including the potential for Th1- or Th2-type Tregs, although it is unclear whether these represent distinct subsets or transcriptional plasticity (8). Animal studies have shown that Tregs may appropriate the transcriptional program of lineage-specific Teff cells to selectively suppress cells of that same lineage (9–11) (e.g., T-bet+ Tregs suppress Th1-driven immune responses). However, this overlap in the transcriptome presents the potential for conversion of Tregs to Teff cells upon loss of FOXP3 expression, and indeed, lineage instability has been described within the FOXP3+ Treg population (12, 13). We recently showed, using a Treg-lineage tracking reporter system in mice, that cells that previously expressed Foxp3, exFoxp3 cells, acquired effector-like properties and were capable of eliciting autoimmunity (14). The studies described above suggest a critical challenge in the transition of Treg-based cell therapies from animal studies to human clinical trials. Knowledge of the purity, stability, and phenotypic characteristics of cell therapy products will be essential prior to their introduction into patients (15). Although optimized sorting strategies have dramatically improved the yield and purity of sorted Tregs, the current use of surrogate surface markers for selection cannot identify a 100% pure population of stable FOXP3-expressing T cells. Furthermore, the need for in vitro expansion opens up the possibility for outgrowth of non-Tregs during culture, or the potential loss of a regulatory phenotype by expanded nTregs. This raises a significant safety concern that expanded Tregs with some inherent autoreactivity may precipitate tissue damage rather than prevent it (16). Given the importance of these issues, we sought to systematically investigate the lineage characteristics and function of a population of CD4+CD127lo/−CD25+ T cells capable of producing IFN-γ. We report in this study that a subset of Tregs coexpressing FOXP3 and IFN-γ was enriched in patients with type 1 diabetes after in vitro expansion while the frequency of nTregs, as determined by highly sensitive epigenetic analysis, was equivalent to that seen in healthy controls. IFN-γ+ cells from expanded human CD4+CD127lo/−CD25+ Tregs expressed high levels of FOXP3 and could suppress the proliferation of responder T (Tresp) cells in vitro, albeit with reduced efficiency. However, epigenetic analysis revealed that FOXP3+IFN-γ+ T cells were predominately methylated at the FOXP3 Treg-specific demethylated region (TSDR) in contrast to what has been shown for nTregs; demethylation of this region is a marker of FOXP3 transcriptional stability (17). Further, the majority of FOXP3+IFN-γ+ T cells did not express Helios, an Ikaros-family transcription factor recently shown to be selectively expressed by nTregs (18). Notably, CD45RA+ naive Tregs cultured in the presence of IL-12 acquired a Th1-like phenotype without loss of FOXP3 or Helios, or remethylation of the TSDR. Our results provide insights into the heterogeneity and plasticity of the human FOXP3+ Treg population and have implications for cell-based therapeutic interventions, particularly in situations involving inflammation. Controls were recruited from the general population at the University of California, San Francisco, University of Florida, and the University of Colorado. Patients with type 1 diabetes were diagnosed by physician examination and comprised recent-onset subjects (within 1 y of diagnosis), and subjects with established type 1 diabetes. For quantification of the FOXP3+IFN-γ+ subset, CD4+CD127lo/−CD25+ Tregs were sorted and expanded from controls (n = 15; 8 male/7 female; mean age 29.2 ± 4.7 y; range 20–35 y) and from recent-onset (n = 9; 5 male/4 female; mean age 27.1 ± 9.6 y; range 18–41 y) and established (n = 2; 2 male/0 female; mean age 25.7 ± 3.6 y) type 1 diabetic subjects, and then analyzed by FACS. For epigenetic analyses, frozen PBMCs from healthy controls (n = 11; 7 male/4 female; mean age 24.1 ± 12.9 y; range 9–46 y) and from recent-onset (n = 12; 9 male/3 female; mean age 16.4 ± 10.1 y; range 8–41 y) and established (n = 28; 7 male/21 female; mean age 22.3 ± 11.1 y; range 5.5–53.4 y) type 1 diabetic subjects were thawed, and an aliquot was refrozen prior to analysis. For quantification of the Helios+IFN-γ+ Treg subset, frozen PBMCs from healthy controls (n = 10; 7 male/3 female; mean age 18.7 ± 8.4 y; range 12–40 y) and patients with type 1 diabetes (n = 11; 7 male/4 female; mean age 18.4 ± 7.0 y; range 9–32 y) were analyzed by FACS. Informed consent was obtained in accordance with approved policies and procedures. CD4+CD127lo/−CD25+ Tregs and CD4+CD127+CD25− conventional T (Tconv) cells were purified as previously described (5) with CD45RA-PE.Cy7 (L48) and in some cases CD45RO-PE.Cy5 (UCHL1) included to isolate naive cells. Postsort purity was 97.6 ± 1.1%, 95.3–98.9% for CD4+CD127lo/−CD25+ cells; 99.3 ± 1.1%, 97.2–100% for CD4+CD127lo/−CD25+CD45RA+CD45RO− cells; and 95.9 ± 2.2%, 92.7–97.5% for CD4+CD127lo/−CD25+CD45RA+ cells. In vitro expansion and suppression assays were conducted in RPMI 1640 media (Mediatech, Manassas, VA) supplemented with 5 mM HEPES, 2 mM l-glutamine, 50 μg/ml each penicillin/streptomycin (Invitrogen, Carlsbad, CA), 50 μM 2-mercaptoethanol (Sigma), 5 mM nonessential amino acids, 5 mM sodium pyruvate (Mediatech), and 10% FCS (Invitrogen). Cells were activated with anti-CD3/anti-CD28–coated microbeads (Invitrogen) at a 1:1 ratio at days 2 and 9. Media and IL-2 (300 U/ml) were added at days 2, 5, 7, 9, and 12. For Th1-skewing, CD4+CD127lo/−CD25+CD45RA+ Tregs and CD4+CD127+CD25−CD45RA+ Tconv cells were incubated with recombinant human IL-12 (20 ng/ml; R&D Systems, Minneapolis, MN) and anti-human IL-4 (10 μg/ml; R&D Systems) during initial activation (day 0). Expansion was 14 d unless otherwise noted in the legends to figures. IFN-γ– or IL-10–producing Tregs were isolated from expanded cells using the cytokine secretion–cell enrichment and detection kit (Miltenyi Biotec, Bergisch Gladbach, Germany) according to the manufacturer’s instructions with the following modifications: 135 × 106 to 400 × 106 cells were activated for 4–5 h with PMA (10 ng/ml) and ionomycin (500 μM) prior to labeling with the catch reagent. During the secretion phase, Tregs were diluted in 10 ml media/107 cells, and Tconv cells were diluted in 100 ml/107 cells to prevent capture of cytokine produced by neighboring cells. Labeled cells were sorted by FACS. Alternatively, cytokine-producing cells were FACS-sorted following fixation, permeabilization, and intracellular staining with IFN-γ–PE or IL-10–PE (BD Biosciences), FOXP3–Alexa Fluor 647 (206D; BioLegend, San Diego, CA), and Helios–PE (22F6; BioLegend). In this case, GolgiStop (4 μl/6 ml culture; BD Biosciences) was added during PMA/ionomycin activation. The following Abs were used: IFN-γ–PE, IFN-γ–allophycocyanin (B27), CD183–allophycocyanin (1C6/CXCR3), CD3–PerCP, and IL-2 PE (BD Biosciences), FOXP3–Pacific blue, FOXP3–Alexa Fluor 488 (206D), and Helios–PE (22F6) (BioLegend), and T-bet PE (4B10; eBioscience, San Diego, CA). Where noted, CD4+ T cells were enriched from peripheral blood using the RosetteSep CD4+ negative selection enrichment mixture (Stemcell Technologies, Vancouver, BC, Canada). GolgiStop was added prior to IL-2 and T-bet staining. Fixation was performed with FOXP3 Fix/Perm Buffer Set (BioLegend). T-bet staining was conducted as previously described (10). Data collected on a FACSCalibur (BD Biosciences) were analyzed with FlowJo (Tree Star). FOXP3+ gates were set based on isotype background staining standardized at 1%. Cell pellets were stored at −80°C, and isolation of genomic DNA and quantification of TSDR (19) and CD3 demethylation (20) by real-time PCR were performed by Epiontis. Frozen PBMCs were thawed and stimulated with PMA (10 ng/ml) and ionomycin (500 μM) for 4 h. After activation, cells were stained for viability using the Violet LIVE/DEAD dye (Invitrogen) according to the manufacturer’s recommendations. Cells were subsequently stained for CD4 and intracellular FOXP3, Helios, and IFN-γ using the FOXP3 staining protocol previously described. Sorted cells were stored at −80°C before RNA extraction with TRIzol (Invitrogen). Real-time PCR was performed as previously described (21) on a 7500 Fast Real-time PCR System (Applied Biosystems), using TaqMan primer-probe Hs99999041_m1 (Ifng), and TaqMan primer-probe set for eukaryotic 18S rRNA as an internal control. In vitro suppression was assessed by [3H]thymidine incorporation as previously described (6). PBMCs were plated in 96-well U-bottom plates (105 cells/well) with 2 μg/ml soluble anti-CD3 (Hit3a) and 1 μg/ml soluble anti-CD28 (28.2; BD Biosciences). Purified Tregs were added at a range of Treg/Tresp cell ratios as indicated. Cells were cultured for 4–5 d and pulsed with 1 μCi [3H]thymidine for the final 16 h of culture. Percentage suppression was calculated as [1 – (mean cpm Treg + Tresp cell)/(mean cpm Tresp cell)] × 100%. Statistical tests were performed using Prism software (GraphPad, San Diego, CA). Significance was determined by t test or ANOVA analysis with Bonferroni correction, as noted in the legends to figures, and defined as p < 0.05. We isolated CD4+CD127lo/−CD25+ Tregs by FACS (purity 98.3 ± 0.7%) and expanded them with anti-CD3/anti-CD28 microbeads and exogenous IL-2, as previously described (6). We consistently observed that a fraction of FOXP3+ cells isolated from healthy donors produced the Th1 signature cytokine IFN-γ after activation with PMA/ionomycin. This fraction remained relatively constant over the course of a 2-wk in vitro culture, suggesting that cytokine production was not induced by expansion conditions (Fig. 1A). The capacity for cytokine production was activation signal strength dependent, as lower levels of IFN-γ were observed when cells were stimulated with anti-CD3 and anti-CD28 (6). These results suggest that a small subset of IFN-γ–producing Tregs exists in vivo. As noted previously by us (6) and others (22–24), these cells tend to be enriched in the CD45RO+ memory T cell population. Isolation of viable in vitro-expanded Tregs capable of producing IFN-γ. A, Flow cytometric analysis of intracellular IFN-γ and FOXP3 expression in CD4+CD127lo/−CD25+ Tregs purified from three individuals (rows I, II, and III) are shown. Cytokine expression was assessed in an aliquot removed immediately after the initial Treg sort (left panels) and after a 14-d expansion period (right panels). B, After expansion, CD4+CD127lo/−CD25+ Tregs were labeled with IFN-γ capture reagent. Frequencies of IFN-γ+ cells before (top plot) and after cytokine capture and sorting of IFN-γ− (center plot) and IFN-γ+ (bottom plot) cells. Data are representative of four experiments. C, Real-time quantitative PCR analysis of IFN-γ expression after cytokine capture and sorting of IFN-γ–producing cells. Mean ± SD of two independent experiments with triplicate measurements, indexed to IFN-γ− Teff cells, is shown. Given the evidence from animal models both for Treg plasticity (14) and for T cell subsets that coexpress Th1 and Treg lineage markers (10), we sought to characterize the lineage and function of human IFN-γ–producing Tregs. CD4+CD127lo/−CD25+ Tregs were sorted and expanded for 14 d. After PMA/ionomycin stimulation, cells were labeled with a cytokine capture reagent and resorted by FACS (Fig. 1B). This procedure yielded viable cells highly enriched for IFN-γ–producing cells (98.7 ± 1.0%). Quantitative real-time PCR confirmed that IFN-γ transcripts were enriched in IFN-γ+ cells relative to IFN-γ− cells (>1300-fold) (Fig. 1C). The frequency of FOXP3+ cells in the IFN-γ+–sorted subset (89.3 ± 8.3%) was comparable with that found in IFN-γ− (96.2 ± 4.0%) and bulk unstimulated (92.9 ± 5.6%) Tregs (Fig. 2A, p value was not significant). Furthermore, IFN-γ+ cells maintained high levels of FOXP3 protein comparable with that observed in IFN-γ− and bulk unstimulated Tregs (Fig. 2B). IL-2 production was low in Tregs compared with Tconv cells (1.0 ± 0.8% versus 13.2 ± 9.6%, respectively) and virtually absent in IFN-γ+ Tregs, consistent with their anergic properties when cultured alone during suppression assays. Notably, transient upregulation of FOXP3 in Tconv did not abrogate IL-2 production (Supplemental Fig. 1). The IFN-γ+ subset expresses FOXP3 protein and has suppressive function. A, Percentage of expanded, PMA/ionomycin-stimulated cells expressing FOXP3 in bulk expanded (grey bar) (n = 8), IFN-γ− (white bar), and IFN-γ+ (black bar) sorted (n = 3) Tregs, assessed by FACS. Shown are the mean ± SD. p = not significant (ANOVA). B, Representative histogram showing FOXP3 expression in bulk expanded CD4+CD127lo/−CD25+ Tregs (shaded) and IFN-γ− (dashed line) and IFN-γ+ (solid line) sorted Tregs. C, Percentage suppression of Tresp cell proliferation in response to CD3 and CD28 stimulation in vitro, as determined by [3H]thymidine incorporation. Bulk Tconv cells (n = 6, gray bars) and sorted IFN-γ− (white bars) and IFN-γ+ (black bars) Tregs (n = 7) were assayed for suppressive function. Shown are mean + SEM. The p values for the percentage suppression by IFN-γ+ compared with IFN-γ− Tregs are shown (two-tailed paired t test). Prior studies have shown that transient FOXP3 expression by Teff cells does not confer suppressive capacity (25–28). To investigate the functional capacity of FOXP3+IFN-γ+ cells, IFN-γ+ cells isolated from expanded Treg cultures were assayed for their ability to suppress T cell proliferation in response to anti-CD3 and anti-CD28 stimulation in vitro. Notably, the IFN-γ+ subset retained partial regulatory function, though with decreased potency relative to IFN-γ− Tregs (Fig. 2C). Importantly, expanded CD4+CD127+CD25− Tconv cells did not suppress Tresp cell proliferation. Together, these data suggest that the IFN-γ+ subset of isolated CD4+CD127lo/−CD25+ Tregs constitutes a regulatory population rather than contaminating Teff cells that transiently express FOXP3. Epigenetic analysis of the FOXP3 TSDR has recently emerged as a robust method for identifying stable nTregs in humans (29). The TSDR of Tregs is demethylated, whereas that of Tconv cells is methylated. Unlike DNA methylation over the FOXP3 promoter region, the epigenetic marks at the TSDR are independent of active FOXP3 expression. TSDR methylation persists during transient expression of FOXP3 by Tconv cells or unstable TGF-β–induced Tregs, whereas drug-induced demethylation of Tconv cells results in stable FOXP3 expression, suggesting lineage stability in Tregs may be epigenetically regulated (17, 30). We therefore examined the TSDR in the different Treg subsets isolated and expanded from healthy individuals. The frequency of cells with a demethylated TSDR was significantly reduced in the IFN-γ+ fraction (22.1 ± 10.1%) compared with that of bulk (83.7 ± 9.6%) or IFN-γ− (94.8 ± 6.1%) Tregs (Fig. 3A). The lower percentage of demethylation in the IFN-γ+ fraction could arise in part from the presence of contaminating FOXP3− T cells, which may have been preferentially selected by the cytokine capture technique. To address this possibility, FOXP3+IFN-γ+ cells were isolated by FACS after intracellular staining, and the epigenetic status of the TSDR in these cells was analyzed. Comparable with the results of the cytokine capture system (Fig. 3A, black symbols), significantly lower levels of TSDR demethylation were seen in FOXP3+IFN-γ+ cells than those in FOXP3+IFN-γ− cells (Fig. 3A, gray symbols). The plasticity observed in the IFN-γ+ subset did not appear to be specific to this cytokine, as sorted IL-10+ Tregs resembled IFN-γ+ Tregs in FOXP3 expression, suppressive function, and TSDR methylation (Supplemental Fig. 2). IFN-γ+ Tregs lack characteristic markers of nTregs. A, Percentage of expanded CD4+CD127+CD25− Tconv cells (squares) and CD4+CD127lo/−CD25+ Tregs (circles) demethylated at the FOXP3 TSDR. IFN-γ− and IFN-γ+ Treg subsets were sorted by cytokine capture (black) or by fixation and intracellular FOXP3 and IFN-γ staining (gray). ***p < 0.001 (ANOVA). B and C, CD4+ PBMCs were enriched with RosetteSep and stimulated 4 h with PMA/ionomycin. 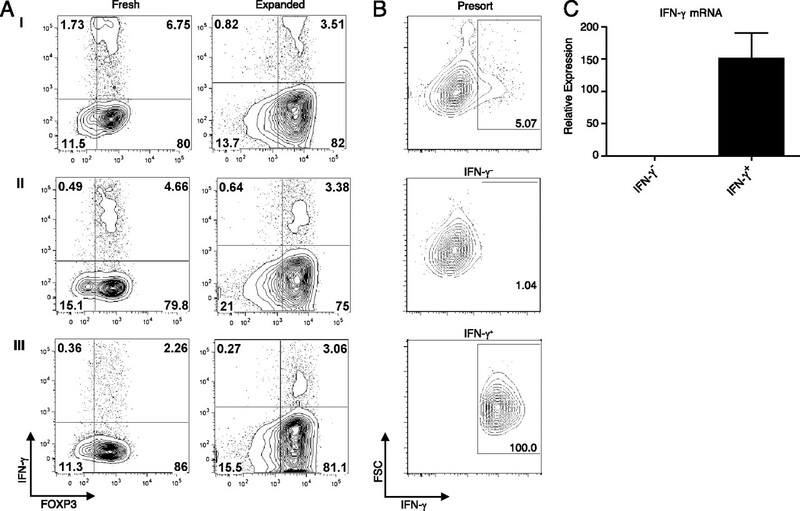 B, Representative flow cytometric analysis of intracellular IFN-γ and Helios expression in the CD3+FOXP3+ gated population. C, Percentage of Helios+ cells within the IFN-γ− and IFN-γ+ subsets of the CD3+FOXP3+ population. The mean ± SD of three independent experiments is shown. ***p = 0.0003 (two-tailed paired t test). Because TSDR methylation in the context of FOXP3-expressing cells has been associated with unstable, in vitro-induced Tregs, we sought to investigate whether the FOXP3+IFN-γ+ subset might have arisen from Tconv cells in the periphery. Although the ability of Tconv cells to differentiate into Tregs under tolerogenic conditions is well-established, there is a paucity of markers for in vivo-induced Tregs. Recently, the Ikaros family transcription factor Helios has been shown to be selectively expressed on nTregs of thymic origin (18). We therefore examined the expression of Helios in the IFN-γ+ Treg subset. Total CD4+ T cells were enriched from PBMCs, and the expression of FOXP3, IFN-γ, and Helios was assessed after activation (Fig. 3B). Within the FOXP3+ population, we observed the selective expression of Helios in the IFN-γ− subset (82.2 ± 1.5% Helios+ compared with only 14.2 ± 0.8% in the IFN-γ+ subset) (Fig. 3C). Signaling through IFN-γR and IL-12R, in combination with TCR engagement, induces strong expression of T-bet, which drives the differentiation of Tconv cells to a Th1 lineage (31). The capacity of Tregs to adopt a Th1 phenotype has recently been demonstrated in murine models (10). However, the plasticity of the human Treg compartment is relatively uncharacterized, and furthermore it is unclear to what extent cytokine production by Tregs is due to true plasticity rather than to heterogeneity in the population. The characterization of the TSDR and Helios expression suggested that IFN-γ production by Tregs was due predominately to a subpopulation of aTregs. However, the observation that a fraction of IFN-γ+ Tregs did exhibit the TSDR demethylation that is characteristic of stable Tregs suggested that even nTregs are a plastic population capable of producing effector cytokines. We therefore tested the ability of human naive Tregs to differentiate into a Th1-like lineage in response to inflammatory stimuli. CD4+CD127lo/−CD25+CD45RA+CD45RO− naive Tregs were sorted to minimize the possibility of contamination with effector/memory T cells or Ag-experienced adaptive Tregs and expanded in Th1-polarizing conditions (IL-12 upon initial activation). Control naive CD4+CD127+CD25−CD45RA+CD45RO− Tconv cells activated with Th1-polarization showed an almost 30% increase in the IFN-γ+ fraction (50.4 ± 15.1% compared with 21.3 ± 9.2% for nonskewed) consistent with previous data on the ability of IL-12 to skew Tconv cells toward a Th1 phenotype (32). Surprisingly, naive FOXP3+ Tregs expanded with Th1 polarization also showed a dramatic induction of IFN-γ (11.4 ± 3.4% IFN-γ+ compared with 2.8 ± 1.7% for nonskewed) (Fig. 4A). We therefore examined expression of the Th1-specifying transcription factor T-bet in expanded naive CD4+CD127lo/−CD25+CD45RA+ Tregs (Supplemental Fig. 3A, 3B). T-bet was more highly expressed in the FOXP3+IFN-γ+ subset relative to FOXP3+IFN-γ− cells (mean fluorescence intensity [MFI] 38.6 versus 23.8, respectively). IL-12 treatment recapitulated this phenotypic difference, as T-bet was upregulated in Th1-skewed compared with nonskewed naive Tregs (MFI 27.9 versus 12.4, respectively). T-bet directly regulates transcription of the chemokine receptor CXCR3, which mediates chemotaxis to sites of type 1 inflammation (33, 34). Indeed, CXCR3 was also more highly expressed in IFN-γ+ than in IFN-γ− CD4+CD127lo/−CD25+ Tregs (Supplemental Fig. 3C; MFI 254.4 versus 149.4, respectively) and was upregulated in Th1-skewed compared with nonskewed naive Tregs (Supplemental Fig. 3D; MFI 417.1 versus 228.0, respectively). Enhanced proliferative capacity was also observed among naive Tregs cultured with IL-12, although it did not achieve statistical significance (2258 ± 2069-fold versus 670 ± 247 for Th1 versus nonskewed, respectively) (Fig. 4B). Notably, despite a marked increase in the IFN-γ+ cell fraction, there was no change in FOXP3 expression (98.0 ± 2.4% versus 98.9 ± 1.5% FOXP3+ for neutral and Th1-polarized cells, respectively) (Fig. 4C). Naive Tregs can be skewed to produce IFN-γ under Th1-polarizing conditions. A, Naive CD4+CD127lo/−CD25+CD45RA+CD45RO− Tregs and CD4+CD127+CD25−CD45RA+CD45RO− Tconv cells were expanded in neutral conditions (open symbols) or with IL-12 added at initial activation (solid symbols). Percentage of Tconv cells or FOXP3+ Tregs expressing IFN-γ+ at day 14 was determined by intracellular staining and flow cytometry after a 4-h PMA/ionomycin stimulation. **p < 0.01, ***p < 0.001 (two-tailed paired t tests). B, Fold expansion of naive Tregs (n = 6) with (solid circles) or without (open circles) IL-12 added at initial activation. p = not significant (two-tailed paired t tests). C, Overlaid histogram showing FOXP3 expression in Treg cultures with (heavy line) or without (light line) IL-12. p = not significant. FOXP3 expression in Tconv cell cultures was also comparable with (dotted) or without (dashed line) IL-12. To investigate whether the increase in IFN-γ production was due solely to induction within the aTreg pool, or whether nTregs could also become Th1-polarized, we examined Helios and IFN-γ expression before and after exposure to IL-12. Naive CD4+CD127lo/−CD25+CD45RA+ Tregs showed minimal IFN-γ production immediately after sorting from the peripheral blood of healthy donors (Fig. 5A). After a 2-wk expansion, IFN-γ production was observed predominately in the Helios− fraction, as observed for bulk Tregs. As expected, the addition of IL-12 at initial activation resulted in a significant increase in IFN-γ–producing cells. Surprisingly, 15.2 ± 5.8% of Helios+ nTregs produced IFN-γ after IL-12 skewing (n = 4) compared with only 1.1 ± 0.5% of Helios+ nTregs cultured in neutral conditions (n = 2), arguing that even the thymic-derived Treg population exhibits plasticity in cytokine production (Fig. 5B). Of note, Helios− Tregs expressed significantly higher levels of IFN-γ per cell than did Helios+ nTregs (MFI 87.2 versus 12.1, respectively) (Fig. 5C). Naive nTregs express IFN-γ in response to IL-12 but maintain Helios expression and TSDR demethylation. A, Immediately after sorting, naive CD4+CD127lo/−CD25+CD45RA+ Tregs and CD4+CD127+CD25−CD45RA+ Tconv cells were stimulated with PMA/ionomycin for 4 h and assessed for intracellular IFN-γ and Helios expression. B, Naive Tregs and Tconv cells were cultured 14 d in neutral (n = 2) or Th1 conditions (with IL-12; n = 4) as indicated. 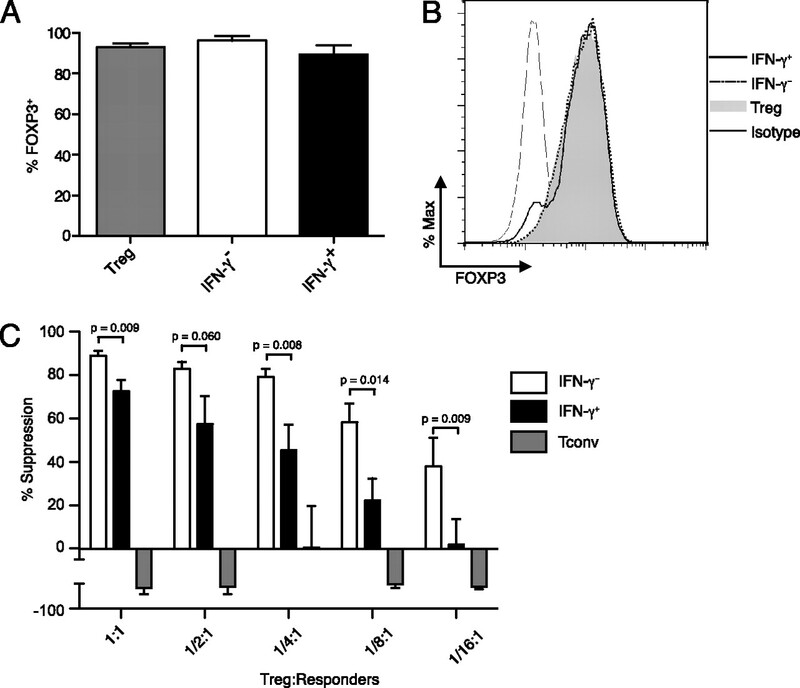 Representative flow cytometric analysis of intracellular FOXP3, Helios, and IFN-γ in naive Tregs and naive Tconv cells after 4-h PMA/ionomycin stimulation. C, IFN-γ MFI in Helios− (white and striped bars) and Helios+ (black and gray bars) naive Treg subsets gated on FOXP3+IFN-γ+ cells after expansion with or without IL-12 as indicated (n = 2). D, Purified naive CD4+CD127lo/−CD25+CD45RA+CD45RO− Tregs (squares) were cultured 14 d in neutral conditions or with IL-12 added at initial activation, as indicated, and then assessed for TSDR demethylation. IFN-γ− and IFN-γ+ Treg subsets were sorted from neutral and skewed cultures by cytokine capture (black) or by fixation and intracellular FOXP3 and IFN-γ staining (gray). **p < 0.01, ***p < 0.001 (ANOVA). E, Purified naive CD4+CD127lo/−CD25+CD45RA+ Tregs were expanded 14 d with IL-12 added at initial activation. PMA/ionomycin-stimulated, fixed cells were sorted based on intracellular IFN-γ, FOXP3, and Helios expression, and the percentage TSDR demethylation in each subset was quantified. Mean + SD is shown (n = 2). To determine whether the induction of a Th1-like phenotype in nTregs was accompanied by a decrease in lineage stability, we assessed the TSDR methylation status of naive Tregs that had been expanded in neutral or Th1-polarizing conditions and then sorted by IFN-γ expression. As expected, naive Tregs cultured in neutral conditions showed robust FOXP3 protein expression (94.6 ± 3.2%) and TSDR demethylation (Fig. 5D). Consistent with our findings with CD4+CD127lo/−CD25+ Tregs, the proportion of naive Tregs demethylated at the TSDR was significantly reduced in IFN-γ+ (25.9 ± 12.7%) compared with IFN-γ− (96.8 ± 1.3%) naive subsets, despite high FOXP3 expression in both populations (98.5 ± 1.9% and 98.1 ± 2.3%, respectively). Surprisingly, in contrast to IFN-γ+ Tregs present in the culture under nonpolarizing conditions, Th1-polarized IFN-γ+ Tregs remained predominately demethylated at the TSDR (73.2 ± 9.9%), demonstrating that TSDR methylation is not a prerequisite for effector cytokine production in Tregs. This also suggests that the increased frequency of IFN-γ+ cells in response to IL-12 reflected de novo IFN-γ expression rather than expansion of the methylated IFN-γ+ subset. Notably, Tconv cells cultured in the same conditions remained completely methylated (data not shown), arguing that IL-12 does not cause TSDR demethylation. However, to more rigorously assess lineage stability after Th1-polarization specifically in Helios+ nTregs, naive Tregs expanded in the presence of IL-12 were sorted based on intracellular FOXP3, IFN-γ, and Helios expression (Fig. 5E). Epigenetic analysis revealed that the Helios+FOXP3+IFN-γ+ subset remained fully demethylated at the TSDR (98.7 ± 0.7% versus 99.7% in the Helios+FOXP3+IFN-γ− nTreg subset). In contrast, the Helios−FOXP3+IFN-γ+ aTreg subset was only 61.9 ± 13.8% demethylated. Collectively, these data imply that nTregs can exhibit flexibility in cytokine production while maintaining lineage stability and therefore support the hypothesis that IFN-γ–producing, TSDR-methylated Tregs found in the circulation may represent an unstable aTreg subset rather than nTregs. To investigate the potential role of FOXP3+IFN-γ+ Tregs in an autoimmune setting, we also isolated and expanded CD4+CD127lo/−CD25+ Tregs from patients with type 1 diabetes (Fig. 6A). The FOXP3+IFN-γ+ T cell fraction was markedly elevated in Tregs expanded from patients with type 1 diabetes (10.6 ± 4.3%; n = 11, p < 0.01) compared with that of healthy controls (5.0 ± 2.1%; n = 15). Nevertheless, total Tregs from these patients exhibited no difference in suppressive function or proliferative capacity compared with those of controls (data not shown). Furthermore, there was no difference in the percentage of nTregs among CD3+ cells in peripheral blood between healthy controls (n = 11) and type 1 diabetic patients (n = 12 for recent onset, n = 28 for established), as determined by TSDR demethylation (Fig. 6B; p = not significant). To clarify whether the elevated frequency of FOXP3+IFN-γ+ T cells in patients with type 1 diabetes represented an increase in nTregs or aTregs, we examined coexpression of Helios, FOXP3, and IFN-γ by intracellular staining of unexpanded PBMCs from a separate cohort of healthy controls (n = 10) and type 1 diabetic patients (n = 11, including 1 recent onset). There was no difference in the percentage of Helios+FOXP3+IFN-γ+ Tregs between controls and patients with type 1 diabetes (Fig. 6C; p = not significant). However, similar to what was observed for total FOXP3+ Tregs, the frequency of Helios−FOXP3+IFN-γ+ Tregs was significantly increased in patients with type 1 diabetes (7.6 ± 2.7%; p < 0.01) compared with that of controls (4.0 ± 2.4%) (Fig. 6D). Patients with type 1 diabetes have an increased IFN-γ+ Treg fraction. A, Percentage of FOXP3+IFN-γ+ cells after 14-d in vitro expansion of CD4+CD127lo/−CD25+ Tregs from controls (n = 15) or patients with type 1 diabetes (n = 11, including 2 established [gray] and 9 recent-onset [black] cases). Intracellular staining was performed after 4-h PMA/ionomycin stimulation and assessed by flow cytometry. When repeated longitudinal measures were taken (gray), the median is shown. **p < 0.01 (Mann–Whitney U test). B, PBMCs from healthy controls (n = 11) or patients with recent-onset (n = 12) or established (n = 28) type 1 diabetes were assessed by real-time quantitative PCR for methylation at the FOXP3 TSDR and CD3 loci. Percentage of FOXP3+ cells normalized to total CD3+ cells is shown. p = not significant (Mann–Whitney U test). C and D, Unexpanded PBMCs from healthy controls (n = 10) or patients with type 1 diabetes (n = 11, including 1 recent-onset case [square]) were stimulated 4 h with PMA/ionomycin. For FACS analysis, viable CD4+ lymphocytes were gated, and FOXP3, Helios, and IFN-γ gates were set as shown in Fig. 3B. C, Percentage of Helios+FOXP3+IFN-γ+ cells. p = not significant. D, Percentage of Helios−FOXP3+IFN-γ+ cells. **p < 0.01 (unpaired t tests). Our data support a growing body of evidence that FOXP3+ Tregs are a heterogeneous and plastic population. An IFN-γ+ Treg subset can be isolated from both CD4+CD127lo/−CD25+ and naive CD4+CD127lo/−CD25+CD45RA+ Tregs after expansion and was found to retain the hallmarks of a regulatory cell: high levels of FOXP3 expression, lack of IL-2 production, and suppressive activity. Despite a regulatory phenotype, the FOXP3+IFN-γ+ subset isolated from expanded CD4+CD127lo/−CD25+ T cells lacked the epigenetic imprinting (i.e., demethylated TSDR) characteristic of thymic-derived nTregs. These epigenetic results suggested the FOXP3+IFN-γ+ subset might not be a stable lineage and led to the speculation that these cells represent an aTreg population, which may exhibit less FOXP3 transcriptional stability relative to nTregs. In fact, type 1 regulatory T (Tr1) cells, which produce high levels of IL-10 and low levels of IFN-γ, have been shown to mediate suppression despite a lack of constitutive FOXP3 expression (35, 36). Although specific markers for aTregs are currently lacking, the transcription factor Helios has recently been suggested to discriminate nTregs from aTregs or Tconv cells. Specifically, FOXP3−CD4+ Tconv cells converted in vitro by activation in the presence of TGF-β, or in vivo by oral Ag exposure, remain Helios− despite robust FOXP3 induction. Furthermore, Helios+FOXP3+ Tregs retained Helios expression 4 wk after adoptive transfer into a congenic host (18). Therefore, although we cannot formally exclude a downregulation of Helios by nTregs, our finding that FOXP3+IFN-γ+ T cells are predominately Helios− argues that this represents a peripherally induced aTreg population. Furthermore, although naive Tregs upregulated IFN-γ, T-bet, and CXCR3 in response to IL-12, they maintained the epigenetic signature and frequency of Helios expression characteristic of nTregs. With the caveat that additional factors or chronic IL-12 exposure may result in lineage destabilization, this finding does not support the hypothesis that the majority of circulating FOXP3+IFN-γ+ cells derived from nTregs in Th1 conditions. Importantly, in light of potential therapeutic applications of expanded Tregs, we have demonstrated that the Helios−FOXP3+IFN-γ+ population is already present ex vivo and is not enriched by our expansion procedures. 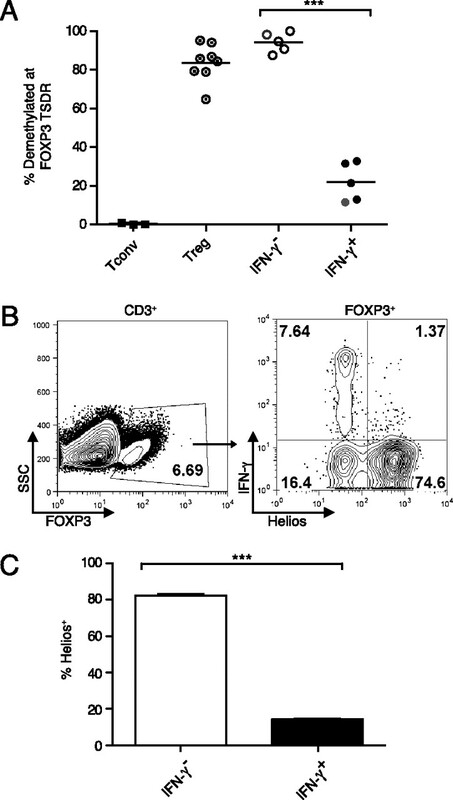 These data argue that FOXP3+IFN-γ+ T cells may arise both from Tconv cells induced to adopt a regulatory phenotype in the periphery and from thymic-derived nTregs exposed to an inflammatory microenvironment, however these cell populations are distinct in terms of Helios expression and epigenetic status of the FOXP3 locus. Nevertheless, the long-term fate of nTregs induced to express IFN-γ+ in response to IL-12 is an important question that remains to be determined. Whether Treg frequency is altered in patients with type 1 diabetes has been the subject of much debate (37) and is complicated by the fact that in humans, FOXP3 expression is not restricted to Tregs but can be transiently induced by a significant proportion of Teff cells after TCR activation (38). In this study we use epigenetic analysis of the TSDR, which is a robust measure of Treg frequency that is independent of FOXP3 protein expression, to demonstrate that there is no deficiency of nTregs in the peripheral blood of type 1 diabetic patients, irrespective of disease duration, compared with healthy controls. It is important to note, however, that circulating nTreg frequencies may not be representative of cell populations at the site of inflammation. Consistent with this, a deficiency in Treg frequency in inflamed islets, but not pancreatic lymph nodes, has been reported in the NOD mouse (39). Furthermore, the ability of Tregs to express IFN-γ in response to IL-12 suggests that not only the number but also the cytokine profile of Tregs in the inflamed tissue may be distinct from those in circulation. We observed a significantly increased frequency of Helios−FOXP3+IFN-γ+ Tregs in type 1 diabetic patients, which suggests a potential role for this subset during autoimmune pathogenesis. In criss-cross experiments, Teff cells from NOD mice (40) or from type 1 diabetic patients (41) were shown to be resistant to suppression by Tregs. However, transfer of Tregs can effectively control disease in NOD even after disease onset (4), demonstrating that a sufficient increase in Tregs can dominantly suppress even resistant Teff cells. Although our studies cannot rule out that FOXP3+IFN-γ+ cells could contribute to pathology, the regulatory properties observed here suggest they may arise in a compensatory fashion to control chronic Th1 inflammation. The observation of FOXP3+IFN-γ+ and FOXP3+IL-10+ Tregs in peripheral blood, most likely reflective of an aTreg population, raises broader questions regarding the roles of these cells in controlling immunity. FOXP3+IFN-γ+ aTregs likely represent a normal response to antigenic exposure, as evidenced by the presence of a small fraction of the subset in healthy controls. Rather than merely increasing Treg numbers, the generation of Th1-like aTregs might also enable a more finely tuned response to inflammation. Consistent with this notion, Tregs coexpressing FOXP3 and T-bet accumulated at sites of Th1 inflammation, and T-bet expression by adoptively transferred Tregs was essential for control of Th1 responses in scurfy mice (10). Furthermore, in patients with recent-onset type 1 diabetes, TGF-β–induced Tregs were more potent suppressors than donor-matched nTregs, whereas no difference was seen in cells from control or long-standing type 1 diabetic patients (42). Similarly, FOXP3+IFN-γ+ human Tregs induced in vitro by allogeneic dendritic cells have been shown to selectively suppress alloreactive T cell proliferation (43). This compensatory mechanism might itself be subject to regulation, as the ability of naive T cells to be converted to Tregs is abrogated in Toxoplasma gondii-induced Th1 inflammation (44). The fate of IFN-γ+ Tregs in patients with type 1 diabetes and the function of this subset in the context of inflammation remain important questions and are the focus of ongoing experiments. Moreover, whether these cells possess autoreactive TCRs against β-cell Ags remains to be determined. Further characterization of human FOXP3+IFN-γ+ Tregs, in particular using Ag-specific humanized mouse models, will be important to elucidate the stability and physiological role of IFN-γ–producing Tregs in vivo. U.H. and S.O. are associates of Epiontis, and U.B. is an employee of Epiontis. Thus, U.H., S.O., and U.B. have declared a financial interest in Epiontis, whose potential product was studied in the current work. All other authors have no financial conflicts of interest. We thank Marc Martinez-Llordella, Dimitri de Kouchkovsky, Samantha Bailey-Bucktrout, Courtney Myhr, and members of the Bluestone and Anderson laboratories for helpful comments and expert technical advice. We thank Mark Atkinson, Kieran McGrail, and Clive Wasserfall at the University of Florida, Peter Gottlieb and Rebecca Wagner at the Barbara Davis Center, and Steven Gitelman and Kathleen Fraser at University of California, San Francisco for providing patient samples. We also thank all those who kindly donated blood for this research. This work was supported by a Juvenile Diabetes Research Foundation Collaborative Center for Cell Therapy grant. T.M.B. was supported by a Juvenile Diabetes Research Foundation transition award. This work also received funding and reagent support from Noel Warner and BD Biosciences. 2003. Autoimmune diseases as the loss of active “self-control.” Ann. N.Y. Acad. Sci. 998: 161–177.
. 2001. Type 1 diabetes: new perspectives on disease pathogenesis and treatment. Lancet 358: 221–229.
. 2004. Therapeutic vaccination using CD4+CD25+ antigen-specific regulatory T cells. Proc. Natl. Acad. Sci.USA 101(Suppl 2): 14622–14626.
. 2006. CD127 expression inversely correlates with FoxP3 and suppressive function of human CD4+ T reg cells. J. Exp. Med. 203: 1701–1711.
. 2009. Expansion of human regulatory T-cells from patients with type 1 diabetes. Diabetes 58: 652–662.
. 2003. Natural versus adaptive regulatory T cells. Nat. Rev. Immunol. 3: 253–257.
. 2010. Mechanisms underlying lineage commitment and plasticity of helper CD4+ T cells. Science 327: 1098–1102.
. 2008. Molecular antagonism and plasticity of regulatory and inflammatory T cell programs. Immunity 29: 44–56.
. 2009. The fate of human Treg cells. Immunity 30: 763–765.
. 2009. Human T regulatory cell therapy: take a billion or so and call me in the morning. Immunity 30: 656–665.
. 2007. Epigenetic control of the foxp3 locus in regulatory T cells. PLoS Biol. 5: e38.
. 2009. Quantitative DNA methylation analysis of FOXP3 as a new method for counting regulatory T cells in peripheral blood and solid tissue. Cancer Res. 69: 599–608.
. 2011. Epigenetic quantification of tumor-infiltrating T-lymphocytes. Epigenetics 6: 236–246.
. 2009. T-bet-deficient NOD mice are protected from diabetes due to defects in both T cell and innate immune system function. J. Immunol. 183: 75–82.
. 2006. Only the CD45RA+ subpopulation of CD4+CD25high T cells gives rise to homogeneous regulatory T-cell lines upon in vitro expansion. Blood 108: 4260–4267.
. 2009. Loss of FOXP3 expression in natural human CD4+CD25+ regulatory T cells upon repetitive in vitro stimulation. Eur. J. Immunol. 39: 1088–1097.
. 2006. Single-cell analysis of normal and FOXP3-mutant human T cells: FOXP3 expression without regulatory T cell development. Proc. Natl. Acad. Sci. USA 103: 6659–6664.
. 2007. 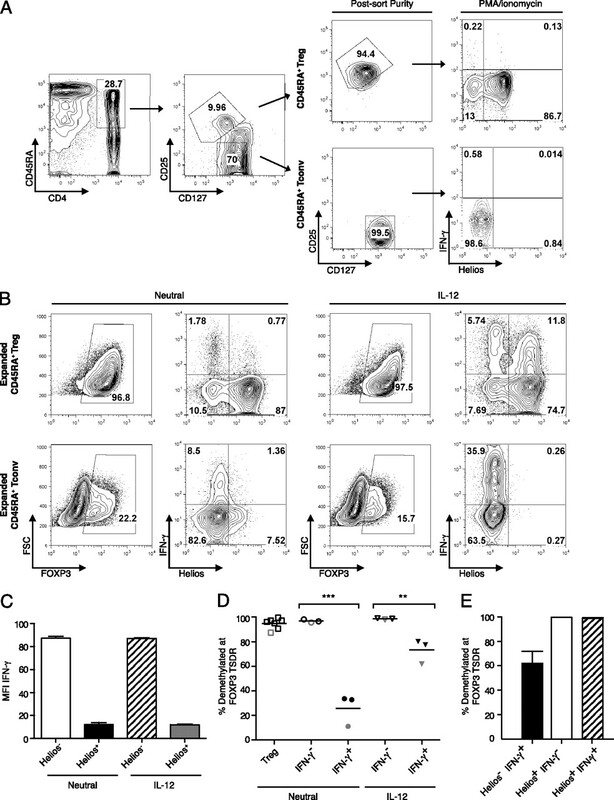 Transient expression of FOXP3 in human activated nonregulatory CD4+ T cells. Eur. J. Immunol. 37: 129–138.
. 2007. Activation-induced FOXP3 in human T effector cells does not suppress proliferation or cytokine production. Int. Immunol. 19: 345–354.
. 2007. Induction of FOXP3 expression in naive human CD4+FOXP3 T cells by T cell receptor stimulation is transforming growth factor-beta dependent but does not confer a regulatory phenotype. Blood 110: 2983–2990.
. 2007. DNA demethylation in the human FOXP3 locus discriminates regulatory T cells from activated FOXP3(+) conventional T cells. Eur. J. Immunol. 37: 2378–2389.
. 2008. DNA methylation controls Foxp3 gene expression. Eur. J. Immunol. 38: 1654–1663.
. 2009. How are T(H)1 and T(H)2 effector cells made? Curr. Opin. Immunol. 21: 153–160.
. 1993. IL-12 induces the production of IFN-gamma by neonatal human CD4 T cells. J. Immunol. 151: 1938–1949.
. 2006. T-bet binding to newly identified target gene promoters is cell type-independent but results in variable context-dependent functional effects. J. Biol. Chem. 281: 11992–12000.
. 1998. Differential expression of chemokine receptors and chemotactic responsiveness of type 1 T helper cells (Th1s) and Th2s. J. Exp. Med. 187: 129–134.
. 2004. IL-10-secreting regulatory T cells do not express Foxp3 but have comparable regulatory function to naturally occurring CD4+CD25+ regulatory T cells. J. Immunol. 172: 5986–5993.
. 2005. Differentiation of Tr1 cells by immature dendritic cells requires IL-10 but not CD25+CD4+ Tr cells. Blood 105: 1162–1169.
. 2007. Treg in type 1 diabetes. Cell Biochem. Biophys. 48: 165–175. 2006. FOXP3: of mice and men. Annu. Rev. Immunol. 24: 209–226.
. 2008. Central role of defective interleukin-2 production in the triggering of islet autoimmune destruction. Immunity 28: 687–697.
. 2008. The defect in T-cell regulation in NOD mice is an effect on the T-cell effectors. Proc. Natl. Acad. Sci. USA 105: 19857–19862.
. 2008. The effector T cells of diabetic subjects are resistant to regulation via CD4+ FOXP3+ regulatory T cells. J. Immunol. 181: 7350–7355.
. 2010. Inducible regulatory T cells (iTregs) from recent-onset type 1 diabetes subjects show increased in vitro suppression and higher ITCH levels compared with controls. Cell Tissue Res. 339: 585–595.
. 2009. Allogeneic induced human FOXP3(+)IFN-gamma(+) T cells exhibit selective suppressive capacity. Eur. J. Immunol. 39: 2703–2715.
. 2009. Decrease of Foxp3+ Treg cell number and acquisition of effector cell phenotype during lethal infection. Immunity 31: 772–786.